Widefield covering the area from Pipe nebula at right to Cats Paw nebula and Rose nebula to the left. The star masses of the galactic center and numerous dark clouds (including Barnards famous Snake at right) dominate the picture, the galactic rift at left adornded by Rose and Cats Paw nebula. 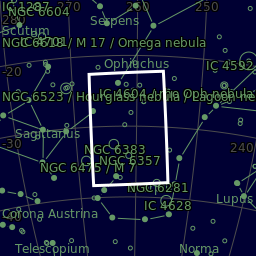 A lot of globulars (M19 and M62 right at bottom)and other Deepsky objects, like little Bug nebula (NGC 6302) can be identified, use the provided annotated version. More difficult to identify are a bunch of asteroids drifting through the field, the brightes being (40) Harmonia, a mag 10,9 tiny speck at the upper tip of the pipe. The two bright stars at left form the sting of Scorpius. Eos 6da at Iso400, Samyang 135mm at f/2. North at right.